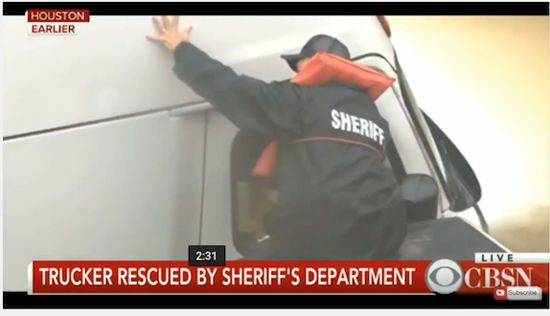 On Saturday, reporter Brandi Smith of Houston’s KHOU and a camera crew were reporting on flooding caused Tropical Storm Harvey when they spotted a semi-truck that has been swept into rising water, said the Daily Beast. The truck’s driver was still in the cabin, which was rapidly filling with water. Thinking fast, she flagged down a Harris County Sheriff’s Department truck hauling a boat. “There is a truck driver stuck here in about 10 feet of water,” she told the officers. As the officers put their boat in the water, they told Smith that a trucker died under the same circumstances in that spot last year. “We had to dive for him because he passed away and went underwater,” the deputy said. Fortunately, Saturday’s outcome was entirely different.